In Green Estate Mahe Island lies a haven of peace, Albizia Lodge. Set in the middle of an undisturbed topical vegetation, Albizia Lodge is ideal accommodation when travelling in the Seychelles Islands. 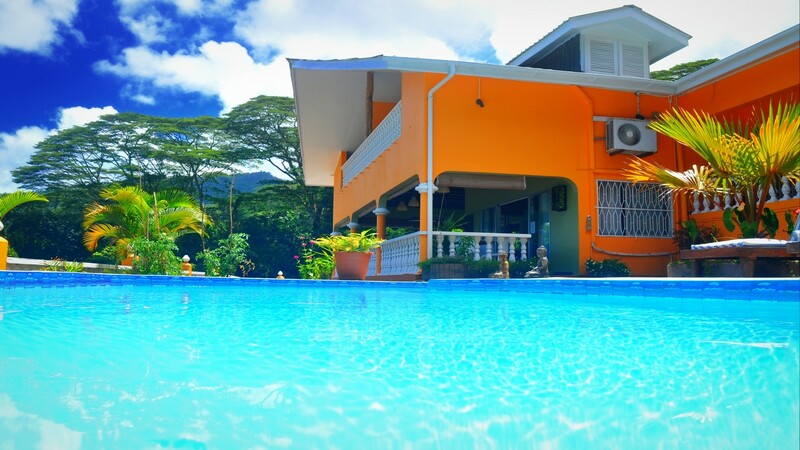 Albizia Lodge has a variety of unique facilities and services in place for guest comfort. This includes a communal living room/ lounge where you can access free unlimited wifi 24 hours, over 50 television channels, in house restaurant, swimming pool, tropical garden, personalised BBQ on request, airport and jetty transfers at a fee, detailed explanations on what to do on the Island and assistance to book tours and excursions. Guest can choose from one of our 6 rooms that has been carefully decorated and equipped for guest convenience. The natural setting with a mountain side back drop provides tranquillity with total privacy. Language Spoken: English & French. Albizia Lodge has its own unique modern style in the middle of nature. Surrounded by a private garden we offer 6 spacious self contained rooms with a private balcony where you can enjoy our amazing sea view. Our room consists of one mini fridge, ceiling fan, air-conditioning, coffee and tea facility and hair dryer on request,TV available in our lounge with over 50 channels. Our guests can enjoy a nice english breakfast at our garden terrace with the melody of our birds while also enjoying our amazing sea view. Have a relaxing time at our pool. Enjoy your time with a drink and have a nice swim. © 2018 Albizia Lodge. All rights reserved.